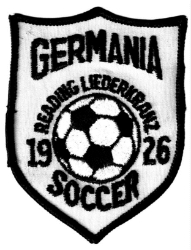 As early as 1922, the Reading-American Soccer Club was established under the name of Germania Soccer Club by a group of German soccer players and soccer enthusiasts. They played "friendlies" in both the Lehigh Valley and Philadelphia. On 26 April 1926 Germania Soccer Club merged with the Reading Liederkranz, and as such became the sports division. Today the Germania Soccer Club consists an over 40 men's team. Registration is open to men 40 or older who would like to try out. Germania Soccer - Meets January and throughout the year as needed. 2018 Germania defeats Conrad Weiser 5-2 to win the EPASL Finals! 2018 Eastern pa Amateur soccer league Champions! Bereits 1922 wurde der Reading-American Fußballverein unter dem Namen Germania Soccer Club von einer Gruppe eifriger deutscher Fußballspieler ins Leben gerufen. Sie spielten Freundschaftsspiele, sowohl in Lehigh Valley als auch in Philadelphia. Am 26. April 1926 fusionierte der Germania Soccer Club mit dem Reading Liederkranz, welcher fortan eine Sportabteilung hatte. Heute besteht der Germania Soccer Club selbst aus: Ü40-Mannschaft. Jeder interessierte Fußballer kann Mitglied werden!